Commercial Roof Coating Project Wins First Place Award for San Francisco Bay Area Roofing Contractor. 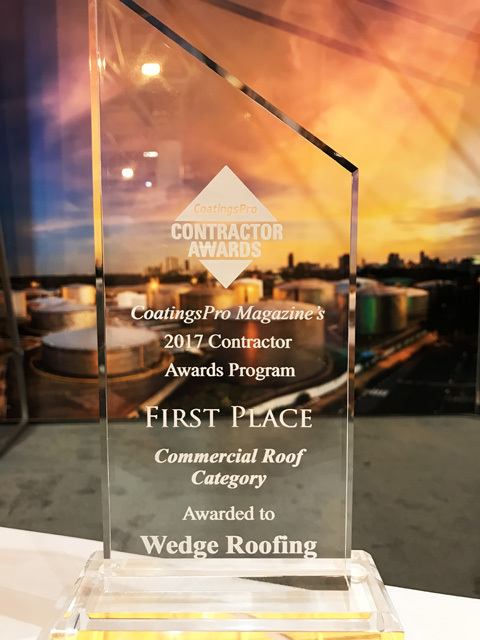 CoatingsPro Magazine honored Wedge Roofing with the First Place Award for Commercial Roof Coatings at the 2017 Contractor Awards Ceremony recently held in New Orleans. The Contractor Award Program recognizes projects and crews that demonstrate excellence in the field of high-performance coatings. Nominations were rated by the CoatingsPro Editorial Advisory Group, composed of industry experts, with help from the technical editor. CoatingsPro Magazine hosted their inaugural Contractor Awards Program at the NACE International CORROSION 2017 Conference held in New Orleans on March 28, 2017. Stephanie Marie Chizik, Editor of CoatingsPro Magazine, presented the awards to contractors throughout the United States in six categories, including commercial concrete, commercial roof, industrial concrete, industrial steel, specialty project, and contractor/crew MVP. Gary Harvey, General Manager of Wedge Roofing, accepted the 1st place Commercial Roof Award for a slicone roof coating project in Sonoma County. About Wedge Roofing: Wedge Roofing specializes in the application of low-VOC, high-grade Silicone Roof Coatings for commercial and residential buildings in Marin County, San Francisco, Sonoma County and Napa. About CoatingsPro Magazine: Founded in 2001, CoatingsPro Magazine is the voice of the high-performance coatings industry, offering news and case studies to provide practical and cost-effective solutions for contractors, applicators, engineers, and industrial facility managers. If they say they can do something, they stand behind their statement. "